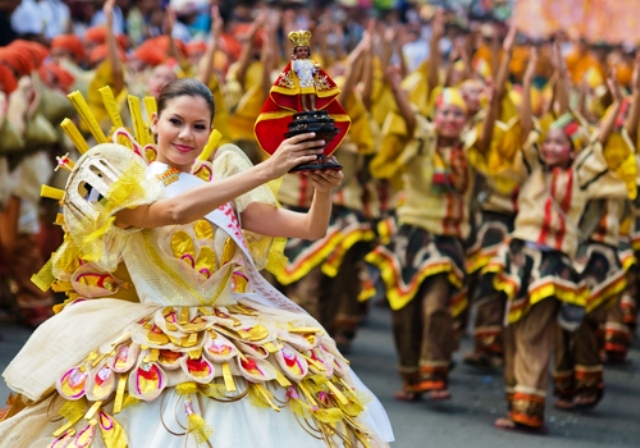 Sinulog Festival is the famous festival in Cebu. It is the largest fiesta in the Philippines. It is characterized as a very long parade with many groups of persons dressing colorful costumes, dancing in the streets accompanied by the loud drum beats. The dancers move two steps forward and one step backward. This dance is traditional and ritual dance in the honor of Santo Niño- the patron saint of Cebu. The word Sinulog comes from the Cebuano word “sulog” which means “like water current movement” that describes the forward backward movement of the dance. When Ferdinand Magellan came to Cebu to introduced Christianity, he gave the Sto. Niño image as baptismal gift to Hara Amihan, the wife of Rajah Humabon. Rajah Humabon is the ruler in Cebu. Not only Hara Amihan was baptized but also about 800 of their people. During 44 years between the coming of Magellan and Legaspi, Historian says the natives continued to dance the Sinulog as the sign of reverence to the Sto. Niño- which is now enshrined in Basilica de Sto.Niño. Through the years, they still continue the small ritual dance in front of the wooden Sto.Niño image. During the fiesta, children were wearing the moro-moro costumes and dance the Sinulog. It was not yet a big event in Cebu. Until, the Regional Director of the Ministry of Sports and Youth Development (MYSD), David S. Odilao, Jr., organized the first ever Sinulog parade. He gathered a group of students and taught on how to dance the Sinulog to the rhythm of the drums. It was just a small parade, but it caught the imagination of the Cebu Ctiy. So they thought of making Sinulog a festival that would rival all other festival in the country. Thus, the Cebu City government planned to expand the Sto.Niño feast celebration. They promote Sinulog dance as an example of the real and unique Cebuano Culture. The Sinulog Festival is held every third Sunday of January, the parade start at 1pm at the Cebu Provincial Capitol and ended about midnight at Fort San Pedro (Plaza Independencia area).